Join actors, musicians and Dr Matthew Green for an immersive, critically-acclaimed tour of London’s original — and best — coffeehouses in the City of London. With free shots of black and gritty 17th-century style coffee! New! Try out our Coffeehouse Tour smartphone app here; watch the first ten minutes of the live tour on Vimeo here. London’s coffee craze began in a muddy churchyard in the heart of the City where, from 1652, an eccentric Greek with a twirly moustache, colourful turban, and preposterous English accent first sold a foul-looking liquid to the public. 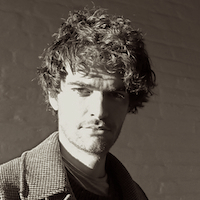 Charismatic young London historian Dr Matthew Green will meet you there to tell the story of how “bitter Mohammedan gruel” transformed the face of the city, brought people together, and inspired brilliant ideas that made the modern, enlightened world. 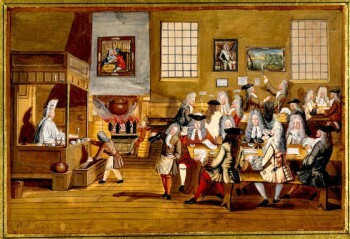 Witness the rise and fall of London’s first coffeehouse proprietor, Pasqua Rosée, the man who triggered a momentous coffeehouse boom as the new drink triumphed over kings, fires, and women fulminating against that “newfangled abominable heathenish liquor called COFFEE” that had reduced their men to effeminate gossipers. Wander past the sites of Europe’s oldest coffeehouses in the labyrinthine alleys and secret courtyards of the City, including Lloyd’s, Garraway’s and Jonathan’s, the triumvirate of coffeehouses that powered the British Empire. Immerse yourself in all that went on inside, from Sir Isaac Newton’s dolphin dissections at the Grecian Coffeehouse to inquisitions of insanity at the Hoxton Square, Samuel Pepys’s metaphysical debates at Bowman’s to corrupt wheeler-dealing in stocks and shares at Jonathan’s; auctions by candle at Garraway’s to the issuing of brutal literary judgements at Button’s. Meet Charles II and furious tavern-keepers hidden along the route. Feel a pang of nostalgia for at an age that cherished the face-to-face exchange of ideas where you could begin a conversation with anyone in the world by demanding “What News Have You?” in an increasingly virtual world as our high streets are invaded by bland Starbucks clones. Thanks so much for the tour you provided for the team from Historic Royal Palaces. It was fantastic – Matthew has a great breadth of knowledge and is able to put it across in a fun and accessible way. It was nicely paced and offered amazing, unique insights into streets that we thought we knew. We especially liked the free ‘gruel’ and special team bonding quiz at the end. Highly recommended! Excellent day with @UnrealCityAudio on this weekend's coffee tour... Hyperliterate jaunt through the history of "soot coloured ninny-broth". See original tweet here. If you live in London and love coffee, I can't recommend this enough. Click here to read the tweet. I am so glad that I took a group of students on the Coffeehouse Walk led by Dr. Green as part of a course on mapping London textually. I had introduced them to the importance of coffeehouses and periodicals in late 17th c./early 18th c. English culture. But nothing in the classroom could have brought that world alive for me and my students as did Matthew and Unreal City's two actors. We all benefitted enormously. History Tutor and Lecturer, Lincoln College. You are really bringing Old London to life with the latest research to boot! Well done indeed! Unreal City's coffee house tour proved sensational - got a real feel for the dirt and intrigue thanks to offbeat genius of Dr Matthew Green. This tour is not just about coffee but gives a very vivid and fascinating account of 18th Century London life. Dr. Matthew Green is an expert in the period and not the boffin you might expect but a very entertaining, charismatic tour guide. There is a strong performance art element to the tour with actors, musicians and other odd balls showing up to partake. Visit the Tripadvisor page for the Coffeehouse Tour. Thank you for that tour. It was excellent and we all thought Dr Matthew Green, Mr Duncan Brown and the rest of the team were brilliant. Our teenage children all appeared engaged which is an achievement in itself.